Fig W0620: Olmec Head from La Venta captured the imagination ever since and feature in many interesting theories about the ancestral roots of this ancient culture – most of which concentrate on the strong African facial features (see fig. W0620) and suggest the Olmec arrived via ancient transoceanic contact. But, whilst the heads are a curiosity deserving of their iconic status, there is nothing to suggest the Olmec considered them ancestors or even part of their own culture. 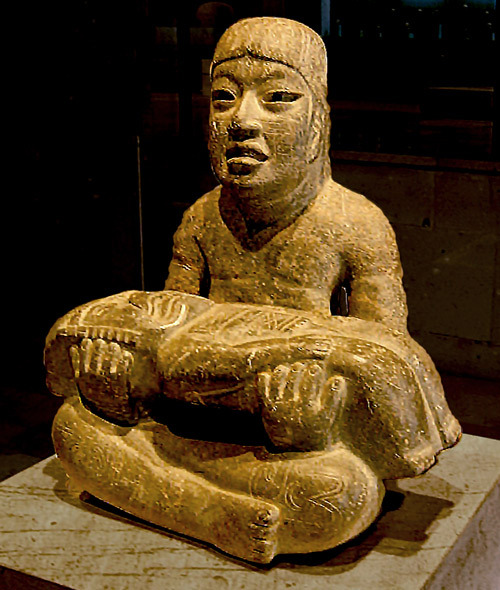 Instead, it is the equally bizarre “were-jaguar” effigies that seem to be the key to uncovering the Olmec’s identity. The Olmec civilisation were given their name by historian Marshall H Saville in 1929 and is based on an Aztec name, meaning “rubber people”. The Aztec had used it to describe a culture from the rubber making region of Veracruz, where many new discoveries had been found which Saville was investigating. It is thought that Saville, who died just 6 years later, was commenting on another, more recent, culture of the same region1, however the name ended up being mistakenly attributed to this much more ancient civilisation. Incredibly, it wasn’t until 1930 that Matthew Stirling began excavations at Tres Zapotes and started to reveal the extent of the city and the Olmec civilisation. Because the city had changed hands following the decline of the Olmec, it took some time to realise that deep underneath the ground lay the remains of Mesoamerica’s founding civilisation. 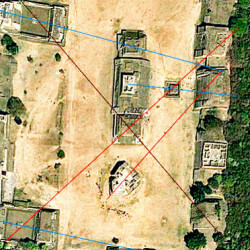 Stirling went on to excavate San Lorenzo in 1938 and La Venta in 1943 with all three sites thought to be Mayan until radiocarbon testing during the 1950’s determined these cities to date from the 2nd millenium BC. Stirling had uncovered a very ancient civilisation which had been long-forgotten by the time the Spanish arrived, and all we know about them is what has been uncovered and hypothesised in the past 60 years. With such strange artwork emerging from the ground, it seems the more that is uncovered, the more mysterious this ancient civilisation becomes. Fig. W0384: Olmec Were-Jaguar One early theme that was identified, was the half-man half-jaguar form known as the “Were-Jaguar”. The “Were-Jaguar” is most easily identified by its human-like form combined with a down-turned mouth, an elongated feline snout and a cleft head. 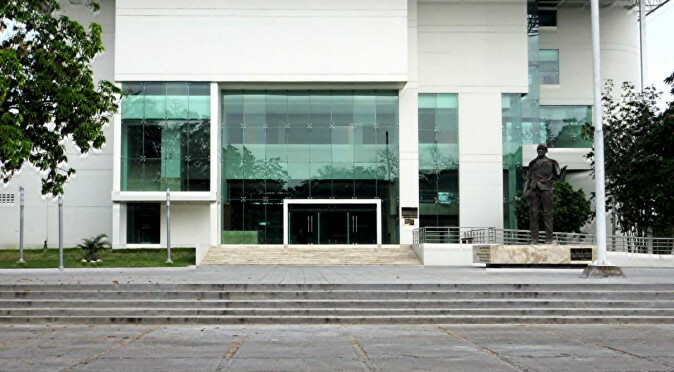 This is exemplified by the basalt head found in the Museo Regional de Antropologia at Villahermosa (fig. W0384), which clearly marries the head of a man with the mouth of a jaguar. This example also features an “X” shaped cross in its right eye, which is a common glyph in Olmec art. The meaning of the “X” is not entirely clear, as it is used in many different contexts and research hasn’t settled on a single meaning. Here it would seem most obvious that it symbolises blindness or death of the eye. However, it could mean the complete opposite, for the “X” is often seen on the attire of the Were-Jaguar and other deities, where it is believed to symbolise the underworld2. With the jaguar having been revered for its nocturnal prowess, it may be that the “X” signifies the ability to see in the darkness of the underworld. Fig. W0626: Monument 77, La Venta Monument 77 at La Venta (fig. W0626) also features the emblems of the Were-Jaguar, including the downturned mouth, ear-pleats, and the “X” across his chest. The “X” also appears on his belt and cloak, where they appear within, or over, symbols of temples or buildings. The association between the cross and death or the underworld could still bare meaning in this context, but there could also be a more simple meaning to it, such as symbolising a unity of four elementary powers, four regions or the four cardinal directions (as the cross is frequently used to denote). Considering the location of the Olmec Empire, which straddled the isthmus of Tehuantepec (the narrowest part of Mexico), it could also be that the shape is not a cross, but a hyperboloid (a horizontal hourglass shape), and relates to the territory that the Olmec controlled either side of the isthmus. If it did symbolise the kingdom or the cardinal points, then the “X” could also have the wider meaning of “everything” or of symbolising universal power. In the context of being used within the eye of the Jaguar God (fig. 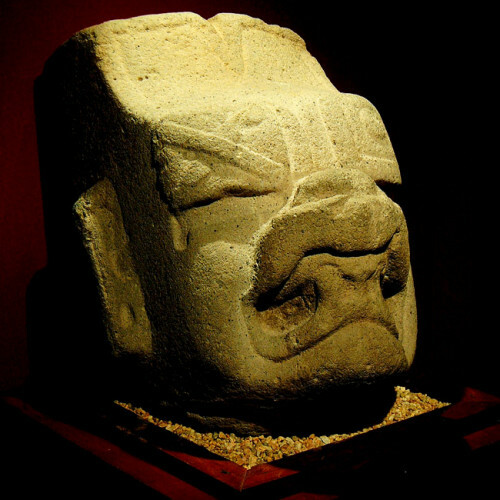 W0384), it could mean the Jaguar God looks over the Kingdom; when used on the chest of Monument 77 (fig. W0626), it could mean he rules the Kingdom; when used with a building, it symbolises the city at the epicentre of their Kingdom; and when used with a temple, it refers to the most powerful temple of the Kingdom. MAE02: “X” of Monte Albaninto the main temples of Monte Albán (click fig MAE02 for more info). 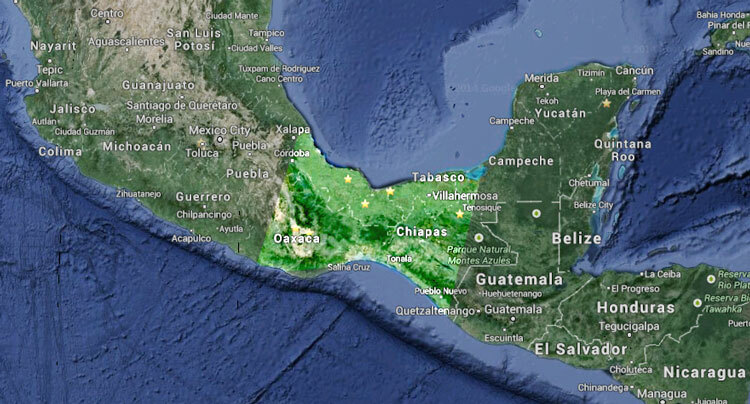 Not only does the map highlight the possibility that the Olmec “X” represents this huge kingdom, but the northern section of the isthmus creates a cleft very similar to that which features on the heads of Olmec statues. This is further punctuated by the three Olmec cities of Tres Zapotes, San Lorenzo Tenochtitlan and La Venta, whose geographical locations create an even more precise “V” shape which truly does resemble the cleft-head of the Jaguar Gods. Fig W0627: Monument 77, La Venta – Rear ImageDespite featuring many emblems of the Were-Jaguar, the statue is named “The Governor”, or ruler, and this concurs with the idea the “X” stands for universal power. Due to the damage, it is not possible to tell immediately if it had a cleft head, but he certainly doesn’t have a snout. However, looking at the rear of the statue (fig. W0627) it is clear that he would have had a cleft head which would have been formed by the special headdress of two crocodiles. Crocodiles, like jaguars, were revered for their vicious fighting and hunting abilities and were also often linked to the gods of waters (such as rain) due to their aquatic habitat. 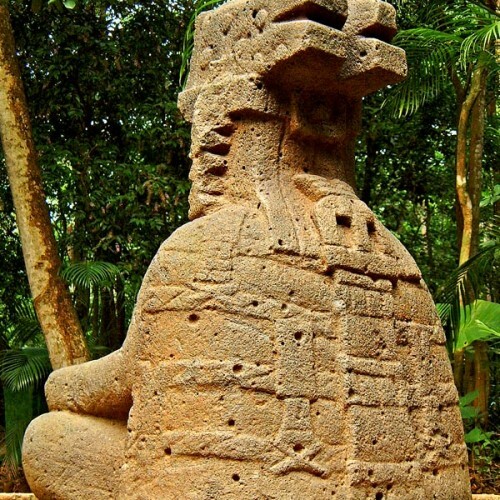 As this man has the downturned mouth of the jaguar (without the animal-like snout) and wears a headdress of crocodiles, it is fair to suggest that he is a human who has been given, or inherited, special animal powers. With the theme of the downturned mouth being so prevalent in both anthropomorphic characters and human characters, it raises the possibility that it symbolises a holy or royal lineage, rather than a physical trait. This lineage may have started with a legendary copulation between a Jaguar (or Jaguar God) and a Woman, with the descendants and kings of the Olmec inheriting the traits of the jaguar. Other animal traits may then have been added through royal marriages and their offspring, leading to a number of deviations of the jaguar form, including the bird and dragon features seen in other images. 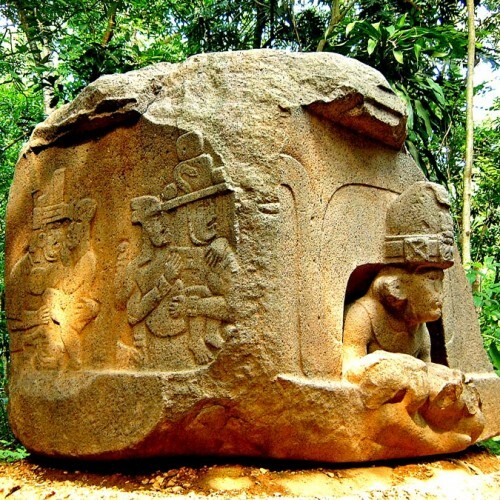 Monument 1, Las LimasBabies and children feature heavily in the carvings and reliefs of the Olmec, which supports the idea that jaguar imagery corresponds to the royal jaguar lineage . 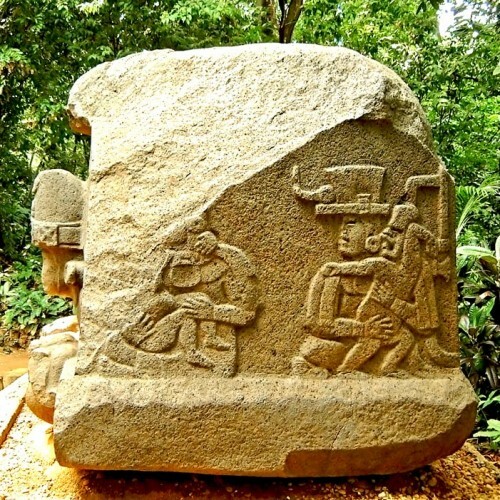 One prime example is Monument 1 from Las Limas, which is a stone carving of a parent holding a were-jaguar baby. The baby exhibits all the emblems of the were-jaguar, including the downturned mouth, ear braids and the “X” across the chest. The parent has inscriptions of four other supernaturals engraved on their knees and shoulders, including the “Banded-eye God”, “Olmec Dragon”, “Bird Monster” and “Fish Monster”. The common belief is that the statue represents the offering of the deformed baby to the Gods. However, the statue could equally be commemorating the birth of a new member of the Jaguar lineage and a successor to the throne of the “X” Kingdom, with the inscription on the knees and shoulders indicating the parent’s own divine lineage which is passing onto the child. Altar 5 from La Venta echoes this theme and features a carving of a parent emerging from a cave holding a young were-jaguar infant. The parent has the “X” on his headdress, possibly indicating that he is the ruler of the city, and an image of the jaguar face on the headband, indicating his lineage. Along each side of the altar are images of four other children with downturned mouths being carried by guardians sporting regal headdresses. Looking from the front, the foremost child on the left hand side appears to have the distinctive crocodile headdress featured on Monument 77 and this could be an infantile image of this ruler. The furthermost child from the right hand side is clearly the “Bird-Monster” as detailed on Las Limas’ Monument 1. The meaning of the altar is unknown, but as with Monument 1 from Las Limas, it could be describing the birth of a new family member, whilst detailing the other divine children as either the siblings or the ancestors (grandparents) of the new-born child. 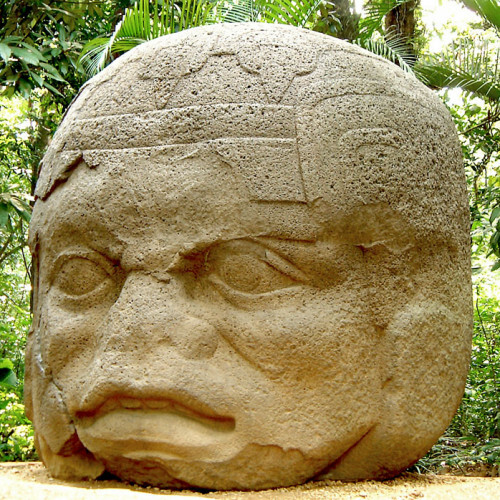 Therefore, it is entirely logical that the Olmec, or at least the royal lineage, believed they were descended from a Jaguar God, who they depicted with a cleft head, large eyes and feline snout. Subsequently, the descendants of the Jaguar God featured downturned feline mouths –this may have been simple iconography of the Jaguar lineage, but it may have been a physical family trait and the story of the jaguar may have been designed to explain this hereditary deformity. The Jaguar Kings wore the sacred “X” badge of the unified state, as well as the ear-plaits and headdresses which emulated the cleft head of the Jaguar God. Subsequent royal breeding married the Jaguar lineage with other powerful royal lines, such as the descendants of the Bird God, the Dragon/ Serpent God, the Crocodile God, and the so on. The sacred offspring of these royal alliances were then recorded on great monuments that would have taken pride of place around the cities of the Olmec kingdom, in the royal palaces, homes of the elite, and sacred temples to remind visitors and citizens of the royal lineage and its super-natural powers. The official research yields a quite different reasoning, it should be mentioned, believing the images of “were-babies” to be portraying the sacrificial offering of new-borns and children to the Gods. 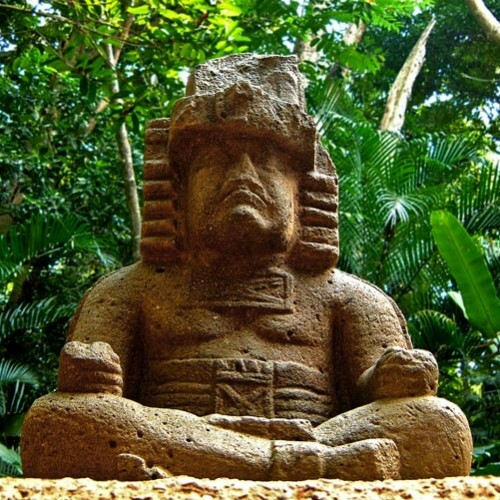 There is no agreement on the existence of the other 7 supernaturals or their roles in the Olmec religion. There is no agreement on the meaning of the “X” thatseems to be of such great importance it appears everywhere. There is little understanding on the difference between the jaguar portrayals which feature the snout and those that simply feature the downturned mouth. However, research is very much in its infancy and the more that is recovered from the ground and private collections, the more understanding researches will have. For the time being, the idea of a jaguar lineage seems as strong, if not stronger, than any other explanation for trends found in the Olmec artwork, and should possibly be known as the Children of the Jaguar. I agree with the concept of the children of the lineage of the Jaguar with one extension. The Jaguar represented the nocturnal Sun. Therefore the imagery would represent the children of the Sun. These “children” would be among the highest of all the lineages as a first lineage.